Huge capacity or slim, this clutch offers a 2 In 1 design. With a removable checkbook, this clutch makes it easy for you to carry cash and travel light! 100% Top Quality Genuine Leather, Soft And Durable. I love this wallet and checkbook holder. I hardly write checks anymore but since I retired I carry my Ipad and this Wallet and that is all I need. 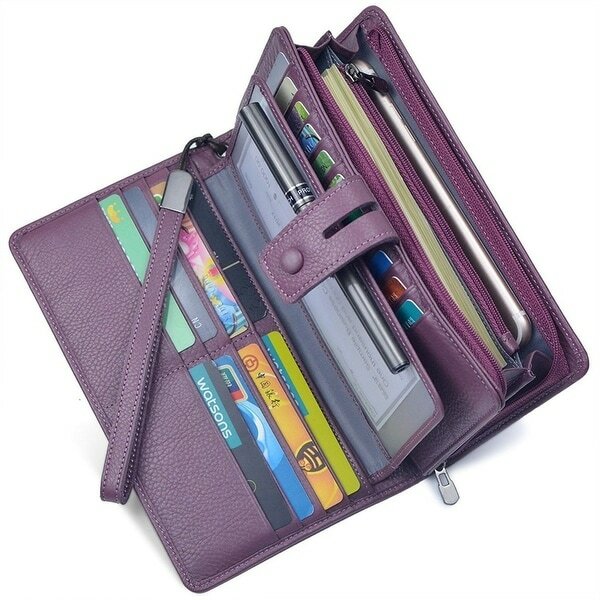 The wallet is nice and big and carries anything I need and it is RFID so everything is safe. Thank you for such a nice product. I LOVE this wallet!!! It has room for all of my credit cards, checkbook, money, and cell phone. I can take it out of my purse when I need to travel light. Like getting gas, I don’t have to worry if someone breaks into my car all of my important stuff is with me. Too bad thief all you get is practice with no reward! I love it! Well worth the money. This wallet is perfect for me. It holds everything neatly and accessible. I love the soft leather. The leather is very soft and I love the color. Has a lot of space and I love the handle. Gave it to my daughter and she did not like it, so I returned it. This is a very nice, high quality wallet. It's overpriced however, which is the only reason I have it 4 instead of 5 stars. . But the leather is very nice and we'll constructed. Nice tight card spots and ample room. Love it! Exactly what I need especially since I keep on losing my tiny wallet. This holds all my gift/credit cards. Love this wallet its everything I need in a wallet. Very nice. Love! Bought one for me and one for a gift. I started using mine yesterday and love all the room. I think my mother in law will love hers to. This was a gift, it worth the money. I feel it's overpriced. I thought that I would invest in nice wallet for my mother but I think I could have bought it cheaper for the quality. Looks like it is big enough for my mother in laws many credit cards. Hers is old and worn. I think it will service my need in keeping all of the important information that I need to carry at all times.